Gonzales hopes a healthy elbow, a new arm slot and the return of the cut fastball will help him find the type pitcher he believes he can be for the Mariners. They’ve certainly heard general manager Jerry Dipoto and manager Scott Servais discuss all that he can/will be for this organization. Enthusiastic, optimistic and at times breathless in their praise for the pitcher they acquired in a largely unpopular trade for slugging outfielder Tyler O’Neill with the Cardinals last July, they’ve made sure to let people know that Gonzales will not only be part of the starting rotation, but should also be much better than the pitcher, who went 1-1 with a 5.40 ERA in seven starts and three relief appearances after being called up. There were hints of it last season for two or three-inning bursts. There were traces of it in his first Cactus League outing on Sunday where he pitched two shutout innings vs. the Dodgers, striking out four batters. But ask Gonzales the question and there is no definitive answer from him. It leads to introspection and reflection about where he’s been, what he’s overcome, what he’s learned and what the possibilities might be. And soon, maybe at some point this season, he’ll be able to find that clarity. Until then, the hope is that he moves closer to a time where that question won’t even need to be asked. The hindrances have been health related. After a brilliant 2014 season where he was named the Cardinals’ minor league pitcher of the year, going from High-A to the big leagues and appearing in 10 games, Gonzales seemed on the verge of earning a spot in St. Louis’ rotation. Instead, his body betrayed him. It started in 2015 when a pectoral strain and shoulder issues limited him to just 17 total appearances in the minor leagues and one awful big league outing. In April of 2016, he was diagnosed with a torn ulnar collateral ligament and underwent season-ending Tommy John surgery. Admittedly, Gonzales has reassessed his post-surgery health status from last season to this spring. But there is something that Gonzales doesn’t want to go back to pre-surgery — his previous arm slot and release point. When Dipoto gushed about Gonzales touching 94 mph at Safeco last season and touted the Brooks Baseball readings of a 92 mph average for his fastball, it wasn’t just due to a surgically-repaired elbow. There wasn’t an epiphany from film study or a recommendation from a coach. It just kind of happened. It finally felt normal and easy to throw a baseball. It wasn’t forced. The gradual process to the lower arm slot started to really take effect a few weeks before he joined the Mariners. The goal is to supplement the change without getting away from it. He’s still meticulous to maintaining that preparation. Gonzales will return the cut fastball (cutter) to his repertoire after not allowing himself to use the pitch last season to protect the elbow. It’s another weapon for him to use. 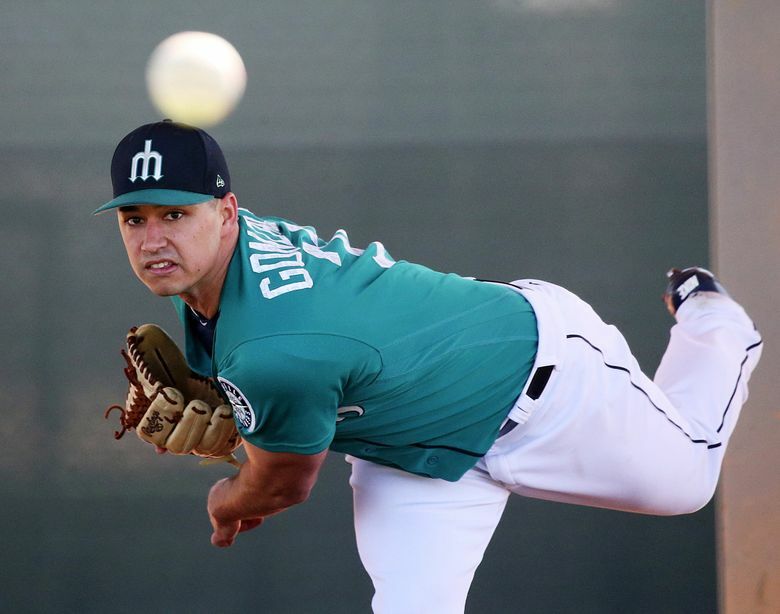 There have been doubts about the Mariners’ projected rotation, specifically the effectiveness Gonzales and Erasmo Ramirez as the back-end starters. Demands to add another starter have permeated from the fan base. Dipoto has remained steadfast in his defense of Gonzales, while Servais believes the young lefty is “really going to surprise people” this season.